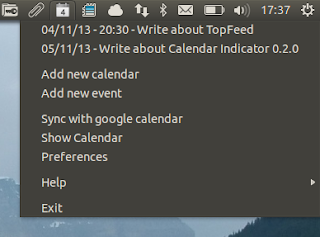 Calendar Indicator is more than just a tool that displays Google Calendar events on the top Ubuntu panel. Besides displaying the next 10 Google Calendar events in the indicator, the application lets you add new events and it comes with a fully-featured calendar that lets you access all your events, edit existing events and so on. From its preferences, you can select the font and background color used by the full calendar events, time between automatic Google Calendar synchronizations, switch between light and dark AppIndicator icons or set Calendar indicator to start automatically when you log in. 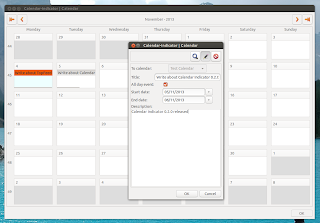 The latest Calendar Indicator 0.2.0 is only available for Ubuntu 13.10 for now, but an older version is available in the PPA for Ubuntu 13.04, 12.10 and 12.04.